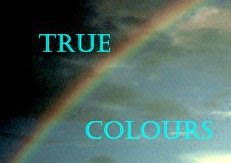 True Colours Thursday is a fun meme hosted at the blog appropriately titled "My True Colours". Click on the badge to join in on the fun! The photo above is of Bear. 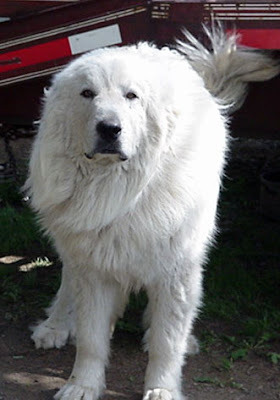 Bear was a huge, gorgeous, wonderful, sweet, loving Great Pyrenees. My dad got him for us as a wedding gift, because he knew we were interested in having a Great Pyrenees to guard our sheep on the farm. However, Bear wasn't interested in guarding sheep, he was a kleptomaniac (hehe). He especially loved containers. At night, he would go around the farm collecting all the containers he could find. When we'd wake in the morning, there would be a perfect line of containers sitting in front of one of the barns. The barn cats' dishes, the feed bins where we poured pellets for the calves, milk jugs, 5-gallon buckets, you name it... they would all be there in a perfect line. We'd put everything back, only to have Bear gather it all up again the next night. Bear was also very, very loving. I could wrap my arms around his big neck, and he'd sit there for hours enjoying the hug. The only part of Bear that would stop you from coming and stealing possessions, jewelry and loose diamonds (which we never had, but you get the idea) would be his bark and his size, but his heart was just full of love. R.I.P. Bear, we miss you terribly. Great shot of your beautiful dog. Sounds like he was quite a character and lots of fun. It's always so sad to lose a canine companion. Aww, Bear sounds like he was a lovely dog and very handsome too. I'm so very sorry about your loss. Bear was a gorgeous boy. The pain that comes with losing such a huge piece of yourself is incredible. I've gone through it more times than I care to remember, but each cherished dog is a vital link in the chain that makes us who we are. They will always be loved as long as we're here to remember them! Bear was a beautiful dog! Wow! He sounds like quite the character too!